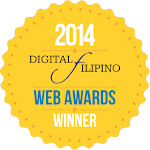 Tocino or tosino is a cured meat product native to the Philippines. It is usually made out of pork and is similar to ham and bacon although beef is also used. It is often reddish in color and has a sweetish taste. Its name is derived from the Spanish word tocino, which is used to describe bacon or cured meat. The meat is sliced into thin strips. Anise wine, annato, water, salt, sugar, and saltpeter are combined in a container. Each strip is then sprinkled with the mixture and then stacked in a separate container, which is covered and kept refrigerated for about three days to cure. Combine all the ingredients.Mix well. Set aside in the fridge for about a day. Fry until cooked.Serve with fried rice. 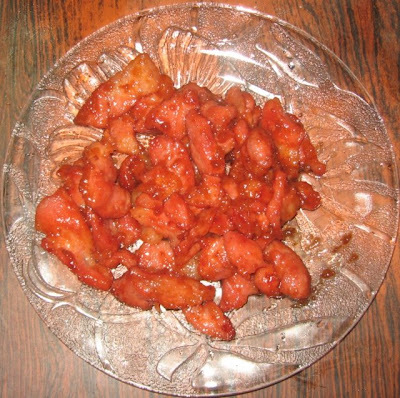 But if you’re too busy,or too lazy or you just wanna have Tocino right this minute, there’s one thing you can do…. 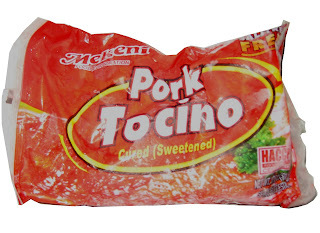 Just go out and buy some… Hahaha..
Our favorite brand of tocino is Mekeni.. what’s yours? I can’t say I have ever tried that but I certainly will keep my eyes open for it in local venues. 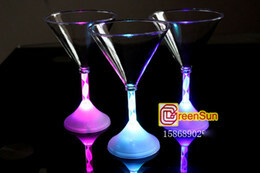 Thanks for stopping by http://kc-photo-blog.blogspot.com/ and leaving comments!! I am a sucker for good food so I will be back. KC. Wow, it sounds good. Is it very spicy? thanks ate peachy! i know i can find a lot of recipe online but i prefer to ask you as i trust your taste when it comes to food..will try it later. I’ll post homemade tocino recipe soon!